“No Boys Allowed” is the theme for this fun and funky guidebook for girls. This book is filled with hours and days of activities and fun to do craft projects, for the “smart and resourceful girl”. 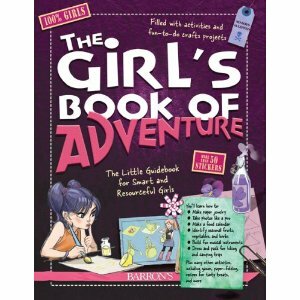 The Girl’s Book of Adventures is something you can take with you to the cottage, in the trailer, keep at home, or pack with you when you are off to Grandma’s house. A great example of one of the projects in here is how to help the budding photographer in your life. You will find instructions on how to take photos like a pro. It gives a well instructed easy to understand breakdown of the basics of taking a picture, how to frame the shot and the impact of light in their pictures. Many of the tips in this book I actually found useful for myself. The book comes in hard cover with bright, fun pictures and text, all on glossy high quality paper. There is a handy elastic that can be used as a bookmark, so you never lose your page. It is not a big or bulky book, so it can fit easily into a backpack. It is filled with endless possibilities of crafts and do-it-yourself projects. Just to name a few are; a list of herbal and wellness teas, different ways on how to tie the perfect sarong (which I found came in useful for me), how to make invisible ink, recipes; including homemade potpourri and sweet and salty recipes, how to make a crown of flowers for a little wood nymph, a list of identifying wild flowers, how to make your own dream catcher and the list goes on and on. The back of the book has an area for sketches and notes, as well as two full pages of brightly coloured stickers. This book is well illustrated and easy to follow. With 122 pages worth of ideas, this book will surely make the imagination soar. Sounds like something I would have loved when I was younger. That looks like perfect reading for my 10 year old granddaughter. This sounds like such a great book….good one to keep in mind! My daughter is only two; however, I’m already stocking up on books for her to enjoy when she’s older. This is one that I should probably add to her collection. I think my granddaughter would love this book! I’ll be looking for a copy for her! I so have to get this book for my 10 year old, she would love it. She’s an avid reader, she would glad spend all day in Chapters. A book full of activities and DIY would thrill her to no end. I think it would be something she and I could learn from together. The girls should love this. Its usually no girls allowed . Now they can get back at the boys. Girls like to read more than boys it seems . This would be a great book for them. thanks for the info on it. My girls would love this! With their birthday coming up, I am definitely going to look for this! Awe now here is a unique kind of book, that’s fun for younger girls. Very cute and different. Great review ! What a fun book & great for my grand daughters when they visit me! This is so fantastic, particuarly because I’ve seen so many books like this but for boys, not girls. I would have LOVED this when I was young. It will be a perfect gift for my 11 year-old niece. This looks like a fun book I could give to my niece. This book sounds wonderful not just for younger girls, but for some older ones too. Cute. Sounds like a great book for “tweens” but with some info everyone would find interesting. Definitely worth checking out. That sarong info would be nice for me. My cousin would totally adore this. She’s 10.